Join RSPB Scotland and Dunecht Estates for a goose watch event at Loch of Skene on the TBA at dawn 07:15 and dusk 15:15. The spectacular sight of thousands of pink footed geese leaving or returning to their roost is one of the autumn�s most dramatic sights. Come along to the goose watch event and take a gander at the geese, as RSPB Scotland and Dunecht Estates hold their joint goose watch at Loch of Skene, on the outskirts of Aberdeen. The goose watch will take place on TBA November and will be split into two events, dawn (07:15 - 09:00 approx) and dusk (15:15 - 17:00 approx). The event promises an amazing atmosphere as people wait in suspense of the spectacle. Attendance is free and open to all, however booking is essential as space is limited. The sight and sound of the geese coming in and leaving their roost on the loch is one of the most fantastic natural events you can witness. We are pleased to be hosting this opportunity and hope those attending enjoy this remarkable experience. Internationally important numbers of pink footed geese now spend their winters in the UK arriving in their thousands from Iceland in the autumn. 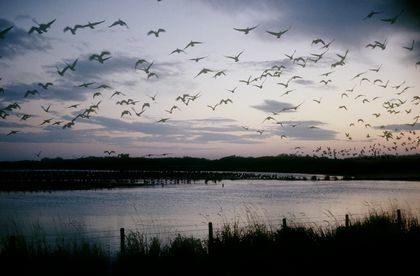 In the 1960�s only 50,000 pink footed geese wintered in the UK, now there are more than 200,000, many choosing to roost on RSPB reserves. The geese, which are smaller than a mute swan but larger than a mallard, do not breed in the UK but make this journey because our climate is milder over the winter than their nesting grounds in Iceland. Amazingly, if the geese have favourable wind conditions, they can make this journey from Iceland to Scotland in around 14 hours. The Goosewatch events at Loch of Skene will start before dawn at 07:15 (to watch the geese leave their roost) and before dusk at 15:15 (to watch the geese returning to their roost for the evening). RSPB Scotland and Estate staff will be on hand with torches, telescopes and binoculars but attendees are welcome to bring their own and are asked to wear warm, waterproof clothing and footwear. Children are welcome , there will be a free prize draw and light refreshments will be available (suggested donation �1). The goose watch events are free but booking is essential as space is limited. We shall update this page soon with the next event and contact details. RSPB Scotland�s work in Aberdeenshire is supported by the Scottish Natural Heritage. The Royal Society for the Protection of Birds (RSPB) is a registered charity: England and Wales no. 207076, Scotland no SC037654. If you host a goose watch Scotland event and would like free listing on this page then please contact me.